Brendan was absolutely the perfect choice for our intimate ceremony and cocktail hour. Our planning session was the easiest of all of our vendors, and he had a clear, defined list of information that he needed. He's extremely easy to work with and was open to hearing our requests for non-traditional ceremony music. He learned three new songs for us and played them beautifully! The cocktail hour was relaxing and peaceful thanks to his mix of traditional and classic acoustic guitar songs. All of my friends and family raved about his playing, and we couldn't be happier with his services. We'd highly recommend him for your event! I can't say enough good things about Brendan. 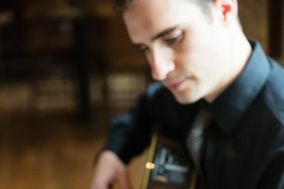 He has such talent, and was able to customize our ceremony by adapting our songs to an instrumental version. He was more than willing to Skype with us (I was organizing from out of state) and talk through our expectations, music preferences, and logistics. He helped make our day seamless, but really his talent speaks for itself. I cannot recommend him more highly--simply fantastic. Gosh, is this guy talented!!! We hired Brendan to play the dinner portion of our wedding. What a fantastic hire he was!! SUPER easy to work with, and I sent him a lengthy play list, which he responded to by confirming he could play nearly ALL our requests (a few were orchestral pieces, so, didn't translate to a solo guitarist). He also took the time to learn a song I had requested as a special surprise for my husband, which was really sweet and appreciated. Not only was Brendan incredibly professional and approachable, his playing was purely beautiful. The dinner portion of our wedding was more of an elegant dinner party for a small group, and he was the perfect background accompaniment. We had nothing but compliments about his playing from all the guests. And, as someone who knows a bit about music, I can assert he truly is a natural talent, and was so at ease performing. It was like he belonged at our event, playing classical and Spanish guitar, and enhancing the night. We couldn't have asked for a more talented musician for our ceremony and cocktail hour. He was absolutely wonderful to work with and made the entire ceremony perfect. Perfect may even be an underestimation. We made several special requests for music during the ceremony and he was able to accommodate each request. Brendan really got to show off his talent during cocktail hour when he played some traditional songs, but also some of his favorites. We gave very little direction and could not have been happier!!! Thank you Brendan for all you to did to make our big day even more special! Dana and I could not have asked for a more professional, wonderful, talented musician to play our ceremony and cocktail hour. Since our first meeting with you, we could clearly see how much you value your work, and the couples that you play for. We felt so lucky that you could be there, and knock the socks off of not only us, but all of our guests and vendors as well! So many people have come to us saying how wonderful your music was, and your presentation overall. Even the vendors who attend 3 plus weddings per week also said how they have never seen someone play as wonderfully as you did with such style. Any bride and groom is lucky to have you!!!! We thank you for making our day that much more perfect!! Thank you so much! Brendan was fantastic! 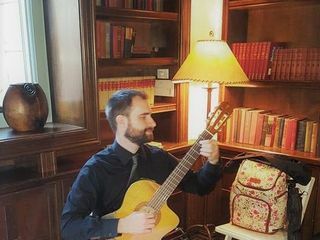 He played the classical guitar during the ceremony and cocktail hour of our wedding. We requested a few specific songs and they sounded better than we expected! He showed up early to the venue and knew exactly what to do and where to go - he made it so easy on everyone who was working with him. I would definitely recommend him to anyone looking for a musician! Brendan was awesome. He was so easy to work with and very professional. He even arranged a piece specifically for our ceremony, which turned out beautiful. I received so many compliments on how beautiful the music was and would recommend him to anyone. Brendan filled our church with beautiful music for the entire service. Worked on special songs that meant a lot to my daughter and her now husband. His guitar solo was added a perfect elegance to the service. Being pretty traditional I felt like we should have some organ or piano but after the day I was so happy that my daughter convinced me that all she wanted was the guitar music, she was absolutely spot on.